While two-wheel riders might rejoice, Automologist LING thinks it is a bad idea. 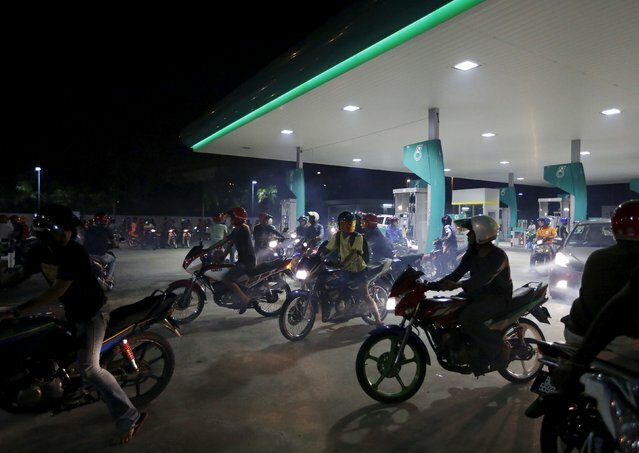 One moment, the Federal Territories Minister said that the Ministry is considering a kapcai-free Kuala Lumpur, the next Barisan Nasional Youth FT announces that it is giving free petrol to motorcyclists in the 13 Federal Territory constituents. Well, that’s a blatant populist move and one that I worry might not bode well for society at large. Datuk Mohd Razlan Mohammad Rafii, the youth wing’s Chief, told Bernama that the assistance was intended to ease the burden of the people. True, I agree that the people are indeed burdened. With the Goods and Service Tax, the cessation of subsidies for food items, the weak Malaysian Ringgit and stagnant monthly income, everyone has had to ‘stretch a ringgit’. But like the BR1M handouts, this is a oversimplified short-term solution with very little effect. The question did arise in my mind regarding how the youth party will be able to fund this new endeavour. It is targetting 117,000 motorcyclists in the Federal Territories to offer them this one-year free petrol programme. But never mind where it is able to korek this huge sum of money from. For now, I am curious to know how much a motorcyclist can stand to save with this programme, and will it help? Let’s say one can stretch a 7 ringgit tankful of petrol for three weeks…. (a quick calculation later)…that’s about 130 ringgit saved in a year. At best, that’s about one week of groceries for a tiny family. When the price of petrol increases, it is not so much how much one has to pay at the pump that affects one’s daily life, but the ripple effect of increased transportation costs that affects the other aspects of daily life, such as the food supply chain. Presently, households living below the national poverty line is, officially, less than one percent. Extreme Poverty is defined as inability to fulfill basic survival needs (food, clothing and shelter), which are households earning less than RM460 a month (in Peninsular Malaysia). I would argue that, at least in the city, this number has to be much, much higher. So, while the free petrol initiative might have good intentions, it does not solve the crux of the problem that is ‘real’ poverty, not what has been prettied up for official reports. You might say that it doesn’t harm anyone. Let the party blow through its money however it wants to. But I beg to differ. Details of how the party plans to carry out this initiative and who exactly stands to benefit from this have yet to be announced, although it is supposed to take effect in April. Although I do not begrudge those who are struggling to to make ends meet a bit of relief, however temporary and minuscule, we should be focusing on reducing the number of vehicles on the road, not to mention the illegal motorbike racers. If Mat Rempits already get to terrorize me during my daily commute, they’ll soon get to do it AND have their petrol paid for as well. If the BN Youth Party wants to give handouts, how about pre-loaded MyRapid cards to encourage them to take the public transport instead?